Easily accessible from Seattle and surrounding areas, Westport, Wa draws thousands of tourists every year. Westport at its very essence is grounded in all things ocean and is referred to as the PNW’s Surf City. When you drive into the seemingly sleepy coastal town, right away you can tell the community is integrated in the fishing industry and surf lifestyle. Walking down the main street there are seafood restaurants serving the freshest catch of the day, idyllic boutiques for shopping, and the observation tower to watch perfect PNW sunsets after a day of surfing. With two local surf shops (The Westport Surf Shop & Steepwater Surf Shop) and three ideal places to surf in town, the Washington surf community originated in Westport and has organically grown since the 1980’s. See below for useful links to the Westport community. Located on the tip of Grays Harbor and open to the swells of the North Pacific, Westport offers consistent waves all year. During the summer months, weak low pressure systems and dominating high pressure systems produce great conditions for beginners to learn to surf and intermediate surfers to hone their craft in waves from the waist to chest high size range. The winter months bring cold fronts from the Northwest that can create waves in the double overhead range for experts to put themselves to the test. Westport has three different surf breaks. Which of the three breaks you head to on any given day depends on: the swell direction and size, the wind direction and speed, as well as your surfing ability. Having three surf breaks that face different directions in such close proximity makes Westport very unique in the Surfing World. This is “The Place to Learn to Surf” and where BigFoot Surf School operates. The beach at Westhaven State Park faces due west and picks up more swell than the other two spots. The ideal wind here is from the east, or offshore in surfers terms. The jetty is located on the North end of Westhaven State Park and to the south there is miles of sandy beach for everyone to Surf. Locals and advanced surfers can often be found taking off on 1st peak, which is the wave that bounces of the Jetty. Please respect the dangers that reside near the jetty rocks and know your limits. Beginners should stay a minimum of 100 meters to the south of the Jetty because of it’s rip that can take you out to open water. Westhaven State Park has newly renovated bathrooms and showers in the Parking lot – really nice feature. Please remember you need to pre purchase an annual Discover pass here https://www.discoverpass.wa.gov/ or pay the day use fee when you arrive at the info box. 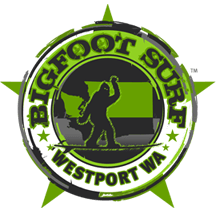 BigFoot Surf School has a permit to operate surf lessons out of state parks and pays both annual and per student fees to the parks department. Around the corner from the Jetty is a crescent shaped stretch of sand and a seemingly quiet bay. During most of the summer this is a great place for Stand up Paddle Boarding, playing Frisbee, or walking the dog. The surf here is more consistent in the Winter and Spring when you get large enough swells that carry waves into the bay and all the way to shore. When the Jetty has 20 foot waves and is not rideable, surfers head to the Cove! The shore here does a sudden drop off from shallow to deep which causes the wave not to break until it is close to shore. When it does break, the wave is fast and hollow (tube). The Cove is known for pounding people and boards into the sand, thus it is not for beginners. Located past the marina at the Northern end of Westport is a surf break nicknamed the Groins. These series of five rock jetties were built to protect the marina from the constant swells that enter Grays Harbor. When the swell is 6ft or more from the NW and the winds are out of the S this place can produce clean long waves. Quality rides await those willing to climb over the rocks and paddle out. The Groins are best surfed on a low incoming tide (from low to high) because you are surfing in the channel that boats take out to the pacific. Strong currents are common and if surfed on an outgoing tide (high to low) you can be swept into the current and carried out the inlet into open water. Because of the current and the proximity to rocks this surf break is for high functioning intermediate and advanced surfers. BigFoot Surf School – It’s Official. It doesn't matter your age or status in life. If you have a willingness to trust and step outside your comfort zone, we can deliver on introducing you to the sport-of-kings and teaching you how to surf! Start surfing now you wont regret it! Not only was I able to scratch surfing off my list of things I had to do in life, but with the help of the coaches at BigFoot I have been surfing almost every week for the last year. And I still hear my coach repeating "slow is smooth, smooth is fast..."
Call us today to book your lessons.